Forbes listed construction management among the ’15 Most Valuable College Majors’ as well as the ’20 Best Paying Jobs for People Persons’. It’s a suitable career choice for you if you are generally interested in building and design. It’ll provide you with an opportunity to focus on a wide range of responsibilities; architectural planning, civil engineering, cost estimating and carpentry. Essentially you’ll be able to work through the various stages involved in a construction project. In order to apply for a construction management role, you’ll be required to have formal education. As a very first step, you may consider enrolling in an associate degree in construction management. Associate degree in construction management provides a fundamental understanding of all the aspects involved in commercial and residential construction projects and equips the students with the managerial and leadership skills that may prove helpful in overseeing a construction project. About the history of various forms of construction methods, project sequencing, documentation and communication and the use of data collection methods such as surveys in residential as well as commercial construction projects. Take the first steps on the path to becoming a construction manager by getting an associate degree in construction management. Why should I pursue the degree online? Online programs are generally equally rigorous in terms of the curriculum and program structure. If you wish to score well, you’ll be required to remain consistent and make all submissions on time. Moreover, before you enroll in a distance learning program, you should check the accreditation status of the institute and program as well as the credentials of the faculty. What are some relevant career opportunities? The associate program prepares students for entry level positions in construction management and other related organizations. You may seek employment in industries such as home building as well as commercial and heavy highway construction. These professionals rely on their engineering skills to assess structural soundness, and compliance with building standards and codes. They plan, coordinate and oversee all activities of construction and extraction workers. Supervisors may have to deal with unforeseen situations and emergencies. 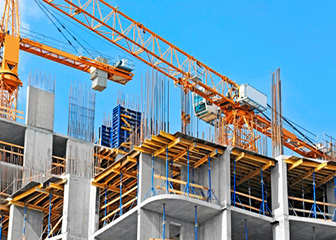 They rely on forecasting strategies to prepare cost estimates for construction projects. Cost estimators work in collaboration with the management and other concerned departments. *All figures taken from O Net Online. The exact level of compensation and eligibility criteria may vary from one employer to another. Therefore you should check the specific requirements of the companies that you wish to work for. Some employers also consider work experience and effective communication and analytical skills as a plus. Alternatively some students go on to further their education in the field of construction management. The credits from an associate degree may be transferred towards a bachelor degree in construction management. A bachelor’s degree will qualify you for more advanced managerial positions. Q:How long does it take to get construction management associates degree? A:To get an associates degree in construction management, you will need at least two years of time on your hands. The courses you will be taught in the program may include the following: construction safety and supervision, principles of management and leadership, fundamentals of blueprint reading and introductory surveying and mapping. Q:What are the admission requirements for construction management associates degree? A:The major requirement to enroll in this program is a high school diploma or a GED. Some colleges might also require ACT or SAT scores. The admission criteria may vary from college to college. Some colleges might require you to have completed few relevant courses prior to applying to this program. However, most colleges do not have any such requirement. Q:What can you do with associates degree in construction management? A:With a degree in construction management, there are several directions you can take your career in. You could think about becoming a land developer, a land-use planner, construction contractor, on-site field superintendent or a construction cost estimator. You can become assume many roles in areas such as planning, development, sales, safety and marketing. Q:Where can you work with associates degree in construction management? A:With an associate degree in construction management, you can work in different settings. You might be able to find employment at construction sites, but there are also opportunities available for off-site work. Popular employment opportunities may include the likes of construction project manager, contractor, construction materials estimator and construction office administrators. Q:How many credits are required for an associatess degree in construction management? A:The average credit hour for an associate degree is 60 credits. However, this may vary a little from college to college. You can successfully earn these credit hours by completing the coursework and meeting all the degree requirements. Please remember that the credit hour requirements will depend on the school you enroll in and the degree track you have chosen.